For centuries, the Hmong lived autonomously in remote areas of China, retaining a unique culture despite ongoing conflicts with Imperial China. Major uprisings, such as the Miao Rebellion (1795–1806) and the Taiping Rebellion (1850-64), occurred when Chinese rulers used military might to suppress the Hmong and other ethnic minorities. These conflicts resulted in a mass exodus by the Hmong into the mountainous regions of Southeast Asia—areas known today as Laos, Myanmar (Burma), Thailand, and Vietnam. In 1893, the Kingdom of Laos became a “protectorate,”or colony, of France, as part of what was known as French Indochina. The Hmong of Laos—perhaps as many as 30,000—were heavily taxed and oppressed by French and Laotian authorities. Xieng Khouang Province was the region of greatest Hmong influence in Laos. Other provinces that had concentration of Hmong includes Luang Prabang, Phongsaly, Sam Neua, and Xayaboury. By the early 1900s, the French and Laotian authorities were letting Hmong leaders, especially from the Moua, Lee, and Yang clans, deal directly with Hmong issues. Since the beginning, the King of Xieng Khouang had always given the authority to the Chao Mouang [Mayor] of Ban Bane to administer the Hmong people in the Nong Het area. When the Hmong people increased in numbers and became prosperous, an old Chao Mouang of Ban Bane decided to nominate a Hmong person to be the Phutong (local official) to help him administer the Hmong people in the Hmong villages. The Hmong Phutong worked very hard. He quickly settled every small dispute so that the villages could make their living peacefully. The Hmong people were very happy. They like the Phutong very much and honored him like a father. During World War II--known by elders in the Hmong community as the Japanese War--the Hmong of Laos were divided into two factions due to internal clan conflicts. Most Hmong stayed loyal to the French and the Royal Lao Government; the rest joined the Communist Party, Neo Lao Hak Xat (renamed Pathet Lao). The pro-French Hmong showed fierceness against the Japanese by rescuing the king in Luang Prabang, who was being held by Japanese forces while they were extending their reach over Southeast Asia. As a result, several Hmong leaders won national political positions. Touby Lyfoung, with his brothers Toulia Lyfoung and Tougeu Lyfoung, were the first successful Hmong politicians in the Lao government. Under Touby Lyfoung’s leadership, Hmong assisted and hid French soldiers from the Japanese military. The Hmong were officially recognized as citizens of Laos in 1947. At the end of World War II, the French attempted to reassert control over their former colonies in Southeast Asia, but were fiercely opposed by Chinese-backed Communist forces in Vietnam and Laos. Many Hmong were drawn into the new war that engulfed the entire region. During the 1954 battle at Dien Bien Phu, Vietnam, about 500 Hmong soldiers were sent from Laos to assist the French. They were days away from the front line when the French surrendered to the Communist Viet Minh; this effectively ended French rule in Southeast Asia. The Geneva Accords in 1954 divided Vietnam into two separate countries. North Vietnam was formed as a communist country, while South Vietnam, a democracy, soon gained American support after the French. Within Hmong society, clan leaders became proactive both politically and militarily in the Lao government. A coup d'état in 1960 in the Lao capital, Vientiane, deepened the country’s political instability. As a result, newly elected US president John F. Kennedy authorized the recruitment of ethnic minorities in Laos to participate in covert military operations against the spread of communism. CIA agent Bill Lair met with the young Hmong military officer Vang Pao to discuss supporting US objectives in Laos. A sharp increase in the number of Hmong troops, supported by American military and CIA advisers, along with huge drops of military supplies, signaled the start of what is now called the Secret War. Of the 300,000 Hmong people living in Laos, more than 19,000 men were recruited into the CIA-sponsored secret operation known as Special Guerrilla Units (SGU) while some enlisted as Forces Armees du Royaume, the Laotian royal armed forces. Each soldier was paid an equivalent of three dollars a month. Air America—the “private” airline contracted by the CIA—dropped 40 tons of food per month. King Sisavang Vatthana of Laos appointed Touby Lyfoung to his advisory board. The US funded new schools throughout the remote regions of Laos, which opened opportunities to Hmong girls. As the war escalated, some Hmong girls were trained as nurses and medics to care for wounded soldiers. In the two worst years of the both the American War in Vietnam and the Secret War in Laos, 18,000 Hmong soldiers were killed in combat, in addition to thousands more civilian casualties. The March 1968 assault by North Vietnamese and Pathet Lao forces on the top-secret airbase at Phou Pha Thi—known to the CIA as “Lima Site 85”—resulted in the deaths of 12 US Air Force personnel, and many more Hmong and Thai soldiers. By 1969, Hmong troop strength was nearing 40,000. Under the new administration of Pres. Richard Nixon, U.S. bombing of Laos escalated, and Congress learned of CIA covert military operations in Laos. In February, a cease-fire and political peace treaty was signed in Paris, requiring the US and all foreign powers to withdraw all military activities from Laos. More than 120,000 Hmong became refugees in their own homelands. 18,000 Hmong soldiers were left in Laos, representing nearly three-quarters of the irregular forces. About 50,000 Hmong civilians had been killed or wounded in the war. On September 14, the Vientiane Agreement was signed, giving the Communist Pathet Lao more control of the Lao government. North Vietnamese Army and Pathet Lao captured Royal Lao positions, and South Vietnam fell to Communist North Vietnam. Gen. Vang Pao and about 2,500 Hmong military forces and family members were airlifted from Long Cheng air base to Thailand. As many as 30,000 other Hmong crowded into Long Cheng, hoping for escape. By the war’s end, between 30,000 and 40,000 Hmong soldiers had been killed in combat, and between 2,500 and 3,000 were missing in action. An estimated one-fourth of all Hmong men and boys died fighting the Communist Pathet Lao and the North Vietnamese Army. The official US military death total in Vietnam exceeded 58,000. 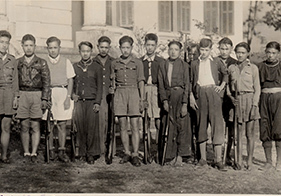 After overthrowing the Laotian monarchy, the Pathet Lao launched an aggressive campaign to capture or kill Hmong soldiers and families who sided with the CIA. Thousands of Hmong were evacuated or escaped on their own to Thailand. Thousands more who had already gone to live deep in the jungle were left to fend for themselves, which led to the creation of the Chao Fa and Neo Hom freedom fighters movements. Many men also took up arms again to protect their families as they crossed the heavily patrolled Mekong River to safety in Thailand. Hmong began moving into refugee camps overseen by non-governmental organizations such as the United Nations High Commission for Refugees (UNHCR), the International Organization for Migration (IOM), the International Rescue Committee, Refugees International ,and the Thai Ministry of the Interior. The first Hmong family to resettle in Minnesota arrived in November 1975. The largest wave came after the passage of the US Refugee Act of 1980. In 2004, the Buddhist monastery at Wat Tham Krabok—the last temporary shelter for 15,000 Hmong remaining in Thailand—closed. This “last wave” came to the US, with as many as 5,000 settling in established Minnesota Hmong communities. The 2010 census recorded more than 260,000 Hmong in the United States. More than 66,000 of that number lived in Minnesota, most of them in or near the Twin Cities—the largest urban population of Hmong in America.